“For a half century, Pittsburgh has been talking about building a subway,” Edwin Beachler wrote in The Pittsburgh Press. The city waited another quarter century more to see the T become a reality. 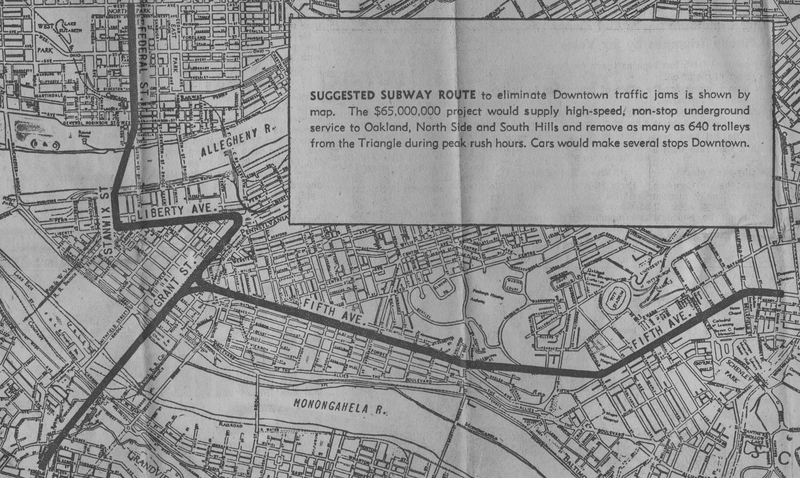 Back in the 1950s, there were hopes of having multiple lines running in and out of the city — yes, even to Oakland and beyond. November 30, 1951. (CLICK TO ENLARGE). That never happened, but the 1.1 miles of Port Authority track that was eventually buried under Downtown cost $480 million in the early 1980s (about $1.3 billion today). The current Downtown-South Hills route was approved in September 1978, and digging began three years later. City and county officials used a 30-foot-long shovel at the groundbreaking. Even larger — though far more effective — tools were used to do the real excavating. Bulldozers worked an average of 35 feet deep, and as low as 45 feet. Drillers had to work around Pittsburgh’s “fourth river,” technically called an alluvial aquifer, water from which feeds the Point State Park fountain and many Downtown air conditioning systems. The subway tunnel was dug 35 feet wide and 22 feet high, with its ceiling 10 feet below street level. Crews made its concrete base 3 feet thick, the roof 2 feet thick and the sides 1 1/2 feet thick. A mere five years later, construction concluded. The first rides under Downtown started July 8, 1985. Trolley lines in the Golden Triangle began shutting down shortly thereafter. Enjoy the historical pictures and info, I personally enjoyed the PG print article on Polish Hill Brereton St.. Memories were activated and I thought about my childhood during the Second World War, as you may know everyone on the home front including children helped in the war effort. We had Victory Gardens ,we collected scrap metals, tin cans toothpaste tubes paper etc. Some kids, me included were Junior Commandos, I can remember picking Milk Weed they supposedly used them for life preservers. I can remember news paper pictures of us Junior Commandos. Might be a thought for a future article on how the populace took part in the war effort. I think this Junior Commando idea started via a comic strip ? The search features at the top and bottom of the site will return just about everything you need. There is also a map found atop the site that breaks topics down geographically. Good article! Forgive my lack of knowledge of Pittsburgh stuff, but is said subway still in operational existence? Miss you, looking forward to October!